Digital pressure gauge with ranges from 0.6 bar (9 psi) up to 600 bar (9000 psi) gauge or absolute for measuring pneumatic or hydraulic pressures to an accuracy of 0.25% full scale. A selection of pressure fittings can be specified which include G1/2 & G1/4 male EN837 test point or 1/2 & 1/4 NPT male. The Baroli industrial digital pressure gauge has a ceramic thick film strain gauge element for medium accuracy and lower cost industrial applications. A 41/2 digit LCD display for the pressure reading and a 6 digit display for displaying text such as pressure units or configuration modes are built into the display panel of the Baroli digital pressure gage. The display can be rotated to any angle for convenient reading of the displayed pressure and is protected from dirt and moisture to a rating of IP65. Using the menu driven membrane buttons below the LCD display the Baroli industrial digital pressure gauge can be configured to display in bar, mbar, psi, inHg, cmHg, mmHg, hPa, kPa, MPa, mH2O and inH2O pressure units. In addition to the live pressure reading the maximum and minimum process pressure limits can be selected and a high or low alarm condition indicated in the top of the LCD display. 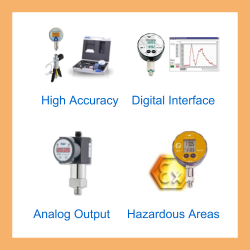 The Baroli industrial digital pressure gauge can also be easily re-calibrated and adjusted via the configuration menu and the auto shut off can be set for 5 different time periods. Do you have any digital gauges which show any form of indication when the pressure drops below a certain value? You can set a high/low indicator on the Baroli LCD display, which appears as one of two arrows depending on which pressure value has been exceeded. I’m looking for a digital manometer for measuring negative pressure to determine the power of suction generated by a vacuum pump? The Baroli 05 can be supplied with a standard range of 0 to -1 bar, -14.5psi, -1000mbar, -29.50inHg, -750mmHg, -1000hPa, -100kPa, -400inH2O gauge for measuring negative pressure. How do I change the battery on a Baroli pressure gauge model M00-1001? The digital pressure gauge is supplied by two 3.6 V-lithium batteries (Type 1/2 AA). Stored values/parameters are also kept after changing the batteries. If the symbol for low batteries is indicated in the display, it is necessary to replace them as soon as possible with two new ones of the same type in order to ensure a good readability of the values. This has only to be done in switched-off condition. An incorrect usage may cause a leak out of batteries and so a damage the device! Never combine batteries of different types or old with new ones. Make sure that the batteries are connected correctly with the corresponding contacts in the battery tray. Never try to charge batteries, demount them, or short circuit them. Keep the batteries away from heat and unshielded flame. Please select the options you require for the Baroli 05 Industrial Digital Pressure Gauge in your application and request a quote. 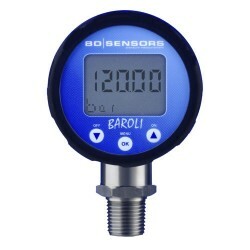 Send us your enquiry for Baroli 05 Industrial Digital Pressure Gauge to get assistance with this product type.